Pearl Crescent (Phyciodes tharos) butterflies are mainly found in the eastern part of North America, but a few of these dainty butterflies can be found as far west as Arizona and the southeastern part of California. I observed this Pearl Crescent butterfly visiting the flowers of an Alkali Marsh Aster (Almutaster pauciflorus) in a marshy riparian area in Tucson, Arizona. The dorsal wing surfaces of Pearl Crescent butterflies are orange with black or brown borders and a variable web of dark, slender, irregular lines. 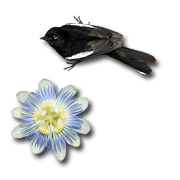 Their less colorful ventral wing surfaces are patterned with cream, pale orange, brown, and sometimes black and pale gray. Their antennae have orange-tipped knobs when viewed from above, but those of the males appear solid black when viewed from below. Not wanting to kneel down on the wet, marshy ground, I never did observe this butterfly from below, so I wasn't able to figure out if it was male or female. 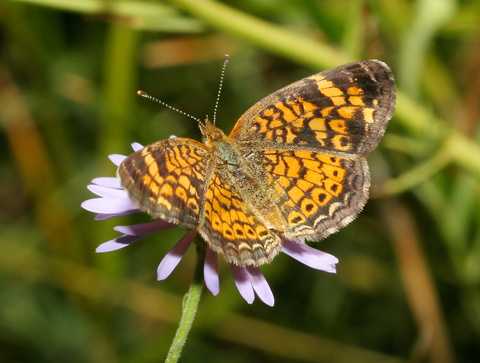 Pearl Crescent butterflies feed on the nectar of a variety of flowers, but aster flowers seem to be a particular favorite, probably because asters are conveniently also their larval host plant. 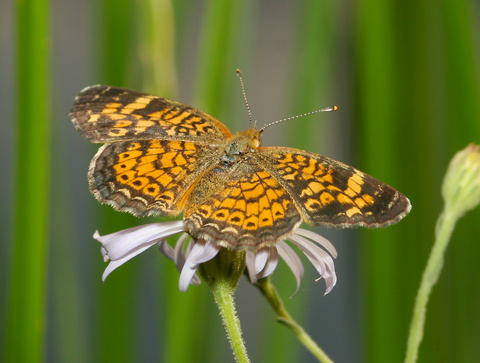 A Male Pearl Crescent butterfly will patrol around an aster plant waiting for any receptive females to be attracted to it.